Home » authors , book marketing , Book Promo , book promotion , Book Sponsor , books , discount price , Limited time only , promo day , Promo Day 2016 , special offer , sponsorship opportunities , Writers » ‪#‎SpecialOffer‬: Be a #‎PromoDay2016‬ Book Sponsor for just €5 per Book! ‪#‎SpecialOffer‬: Be a #‎PromoDay2016‬ Book Sponsor for just €5 per Book! Take advantage of the limited time offer for Book Sponsors. Pay half price when you order before 1st March 2016! That's just €5,00 per book! So what do you get as a Book Sponsor? * Your book cover and purchasing link will be shared on the Promo Day social media profiles (Facebook, Twitter, Pinterest, and Google+) 3 times (once prior to, once, during, and once after the event). 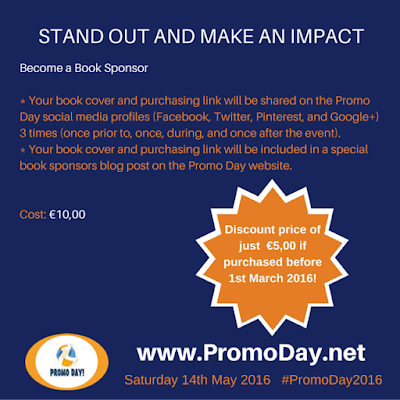 * Your book cover and purchasing link will be included in a special book sponsors blog post on the Promo Day website. This offer is valid only until 1st March 2016 so act now!